This is the perfect bread to go with a bowl of soup. It needs a long rise, but other than that, it's minimal work. The recipe comes from Mette Ankarloo, who's written several books on baking. Crumble the yeast into a bowl, and add the milk and water. Whisk until the yeast is dissolved, then add the honey and flour. Work really well - about 15 minutes on low speed in a Kitchen-Aid. Add the salt, and knead for two more minutes. Wrap the bowl in plastic, and leave the dough to rest for at least two, but up to five hours. 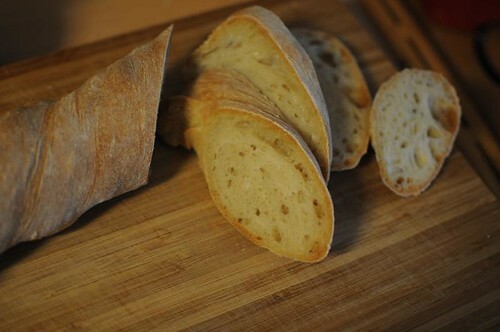 Turn out the dough onto a well-floured surface, and taking care not to knock out all the air, shape two large baguettes. Place them on a baking sheet, and let them rise for about 30 minutes. Bake for five minutes at highest possible temperature, and then at 200°C for about 20 minutes. You can mist your oven with water during the baking, to create steam - it helps build a chewy crust. Do you think this bread could be made with whole wheat flour of would it need modification? Thanks for a great blog! The bread looks fantastic ! Will try out this recipe and let you know . I've been looking for a good baguette recipe . Anyway , I like your blog , to the point and apt . I love baking , I guess you do too ! Best of luck with that ! Anne, should the milk be whole milk or is skim or lowfat milk O.K.? I'm thinking, if I use skim or lowfat (mellanmjölk) milk, maybe I can use more milk and less water, maybe 3 dl milk, 3 dl water? The dough after all might need some small amount of fat? If I use totally fat free milk maybe I should add a Tbs of canola or other oil? Or does the dough need milk fat to come out right? I have a silly husband, in good health at 76, who wants to keep everything fat-free. It's a challenge and I fib when I have to. I'll say something has egg white in it but keep the one whole egg to myself. :( But we need som fat, right? About the question of whole wheat flour in one comment, I would maybe use no more than 1/3 (en tredjedel) whole wheat. I use "wholwheat white", finely ground, a lot in my baking. But how much can we change a recipe before it gets to the point of no return?